Since the first application of the principle of continuous casting to steel in the test continuous casting machine of Junghans of former West Germany, the quality of the continuous cast product has been paid more and more attention. In recent years with the stress on the production of clean steels, there are higher requirements for the microstructure and the composition homogenization of the cast product. The chemical composition, solidification conditions and the nature of the liquid steel flow in the mould affects the surface quality and the inner structure of the cast product. The application of electromagnetic stirring (EMS) technique promotes the formation of an equiaxed crystallic zone in the strand. It causes the refinement of the solidification structure, the reduction in the content of inclusions and improvement in the quality of the surface, sub surface and the inner structure of the cast product. It is well known that an alternating magnetic field (B) (either single phase, two phase or three phase) applied to a conductor, whether solid or fluid, will induce electric current (j) in the conductor, and hence there is a force (F = j x B). This force is known as Lorentz force. Due to the Lorentz force there is a generation of a torque that gives the liquid steel a rotational movement. The generated torque depends on the following factors. These parameters change depending on the stirrer type. Thus the magnetic field acts as a non intrusive stirring device and it can, in principle, be engineered to provide any desired pattern of stirring. The stirrer design, size and position etc. depend on the continuous casting machine data, the steel grades to be produced and the casting parameters. Electromagnetic melt stirring systems create a rotating magnetic induction field with an induction of B, which induces eddy current j in a direction perpendicular to B, whose velocity is v. Induction B and current j create the electromagnetic force, which works on every unit of volume of steel and bring about a stirring motion in the liquid steel. The vector product (v x B) demonstrate a connection between the electromagnetic field and the flow of the liquid steel. The speeds of the liquid steel caused by the EMS is somewhere in the range of 0.1 m/s to 1.0 m/s. An EMS system has the following five major equipments. Power pack including transformer and high and low voltage power distributor. The process of strand formation in a continuous casting machine includes solidification of the liquid steel in the mould and in the secondary cooling zone (SCZ). Rotating or travelling magnetic fields affect the nature of flows in the liquid steel and intensify the heat mass transfer processes. The degree of influence of electromagnetic stirring on strand quality depends on the technical characteristics of the EMS and on its arrangement on the continuous casting bending axis. There are three possible EMS applications in a continuous casting machine according to the position and the required effects on the cast products. These places are mould (M-EMS), secondary cooling zone (S-EMS) and final solidification zone (F-EMS). The three types of EMS are shown in Fig 1. M-EMS – M-EMS is usually installed in the lower part of the mould for stirring of the liquid steel in the mould. It improves surface, sub surface and inner strand quality. The application of M-EMS results into reduction of pinholes, centre porosity and segregation in the cast product. It improves the solidification structure, reduces the surface roughness and increases the heat delivery rate. M-EMS is either of round or square design and it can be installed internally or externally. For providing flexible control of stirring speed in the mould meniscus, dual coil M-EMS has been developed. The dual coil M- EMS consists of two independent EMS. The upper EMS is meant for flow control in the meniscus and the lower EMS performs the stirring of main metal in the mould. The reduction in the liquid steel speed in the meniscus is achieved by rotating the upper EMS magnetic field in the opposite direction to that of the lower EMS. Such a design of dual M-EMS widens the opportunities for using the EMS technique under various conditions of continuous casting of steel. S-EMS – S-EMS produces a stirring force that pushes the liquid steel horizontally along the cast product width and generates a butterfly type flow pattern in the liquid steel. When S-EMS can be placed behind the support rollers (Fig. 2 ) then it is not dependent on a minimum support roller diameter and hence in this case can be optimally placed along the strand from the metallurgical point of view. S – EMS when built into the support rollers requires a minimum roller diameter to include the iron core and windings. In this case the stirrer is placed at a distance from the meniscus and hence is less effective. S -EMS operates at low frequency to ensure good penetration of the stirrer force through the strand. As a result the liquid steel has transverse stirring as shown in Fig 2. S –EMS is usually used in combination with M – EMS. S – EMS can be of either linear or rotary type stirrer. Most common is the linear stirrer, which is easy to install and protect against heat radiation and possible breakouts. S-EMS promotes the formation of equiaxed structure. It promotes grain refinement in the cast product and reduces the shrinkage cavity, centre segregation and internal cracks. It also removes superheat effectively. 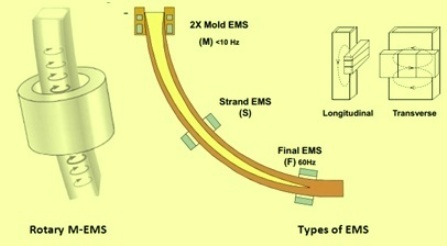 F- EMS – There is equally strong interest in using EMS to stir far below the mold in the final solidification zone of a continuous casting strand. However, conventional EMS systems have proven to be somewhat ineffective when applied in this region. As a potential solution, there recently has been considerable interest in applying modulated Lorentz forces in an effort to develop a broadly distributed vigorous stirring in the final zone. F-EMS is generally installed in combination with M-EMS or S-EMS to reduce and cut peaks in centre segregation. F-EMS is particularly efficient when casting high carbon or high alloy steel grades. Also with the use of F- EMS, it is found that the solidification structure of the cast product is improved and there is increase in the ratio of the equiaxed structure and the inner porosity. The shrinkage is reduced, and the ratio of central carbon segregation is decreased. Further the secondary dendrite arm spacing (SDAS) is improved, and the ratio of central equiaxed grain is considerably increased, which results in finer grains. Therefore, the quality of the cast product is enhanced with the F-EMS. The benefits available by using one or more EMS in combination are listed in Tab 1. ** Better structure only in centre part of the product, after position of S-EMS, worse structure in external part compared to application of M-EMS. Risks of negative segregation when excessive stirring applied.